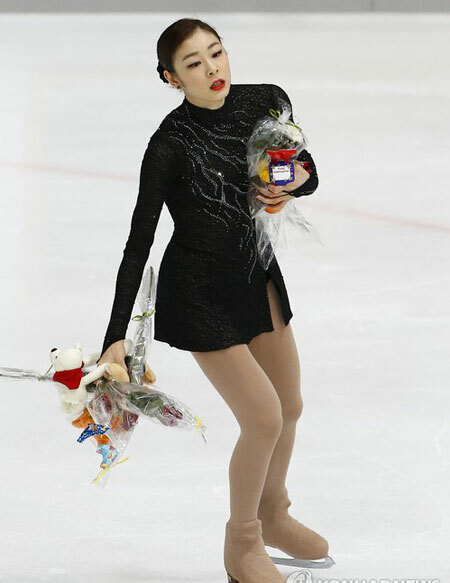 After all, two-time world figure skating champion Kim Yu-na, the “Ice Queen” with a perfect stage presence, is only human, saying that she is not a natural born talent, and neither is she always perfect. “I rarely get the response of emotional support I want. But sometimes I need it,” said Kim in an interview with a television program Sisa Magazine 2580 of Munhwa Broadcasting Corporation (MBC) on Sunday. She had the interview on Dec. 5, right after the Golden Spin of Zagreb in Croatia ㅡ a tune-up ahead of the Sochi Olympics in February. “People expect that I’ll be just perfect on ice, and that’s not the case. I make mistakes, too. When I review my performance, sometimes I feel I did awful. That’s the whole part of the process of what people see when I’m performing,” she said. Maintaining physical strength is another issue, she added. “The doctor said women past 18 years of age start ageing, and that might be the reason it takes more time to recover. So I thought, ‘I’m old now…’ I have to put in much more effort to keep myself in optimal condition. It’s physically really demanding,” said Kim.